John Baeder (born on Christmas Eve 1938), is one of the original artists of the American Photorealism movement. 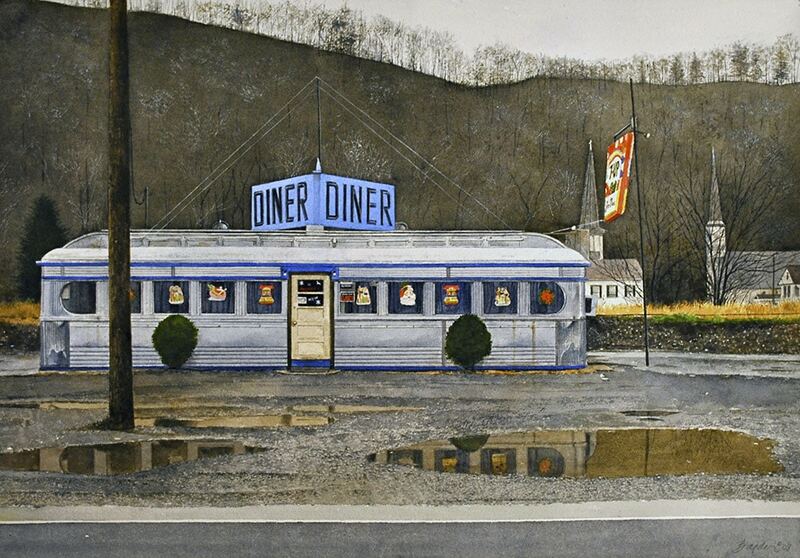 His artwork incorporates unique subject matter including: manufactured dining cars, roadside imagery, and vast impressions from mid-century America. He masterfully defined “Classic Americana” and in his visual language captures the essence of an area of America’s past. At the heart of his artwork is the concept of community, the human condition and long-held American values. His paintings bring to life places that are inherently important, whether or not it is realized by all. John Baeder was born in South Bend, Indiana. 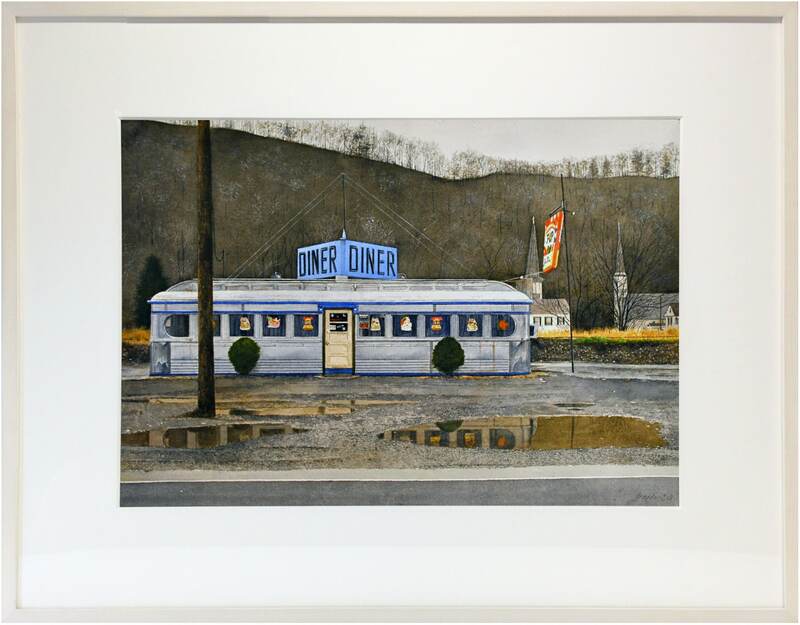 He is most recognized for his paintings and prints of vintage roadside vernacular from the golden age of America. 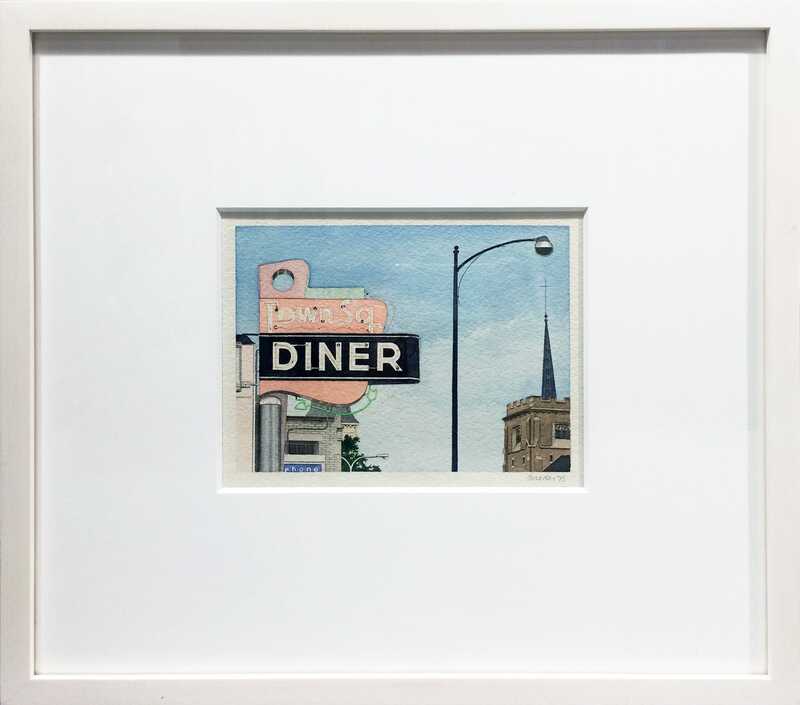 His relationship to diners was always a part of his life and focus, while his works were born from a variety of interests and even another career. Baeder studied at Auburn University in the 1950s. As a child he did not travel frequently, however he did take the train to and from Indiana for special vacations. At this young and impressionable age he soaked up the imagery outside of the train windows, mesmerized by the sights before him – each town and impression a seemingly beautiful moment in time, reminiscent of a painting. Growing up, he collected post cards from places like those that he had seen on the train. He was a hardworking student, tuned-in to emerging forms of art. Traveling to and from college, he was affected by the culture of the back roads. Prior to his life as a painter, Baeder was an award winning art director, working both in New York and Atlanta. During his time as an art director, he maintained his creative nature and abilities outside of the work place by doing much photography of both the urban landscape and America’s roadside. From 1966-1968, he worked at Ted Bates, a major advertising agency across the street from the Museum of Modern Art. Baeder spent time in the photography department of the museum, arrested from the chaos and intensity of the advertising business. He escaped into his enjoyment of photography and documented his surroundings which would later become American icons: art history in the making. He cherished the old postcards of roadside America which included: gas stations, diners, tourist camps, motels, and small-town streets. These images were inspiration for future paintings and it was Baeder’s curiosity about what the post cards would look like blown up as paintings, that ultimately initiated his long and successful career as a painter. However, Baeder never knew that he would be a painter. A career was born when his inclination to paint his life impressions became a reality. Baeder found a fascinating and enthralling escape in the novelty of painting roadside and urban culture: subject matter radically different from that within the airbrushed and contrived world of advertising. He created a group of four paintings and was quickly recognized by Ivan Karp. Within six months of the introduction, Baeder had his first exhibition at O.K. Harris. Though he experienced personal change and challenge when he gave up his career for painting, he ultimately found an invigorated sense of self and dedicated his life from then on to painting. 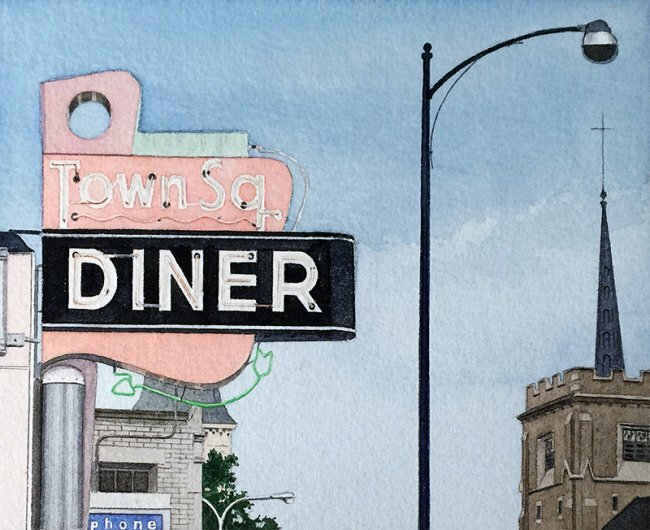 It could be argued that he alone made diners into timeless icons of American civilization. 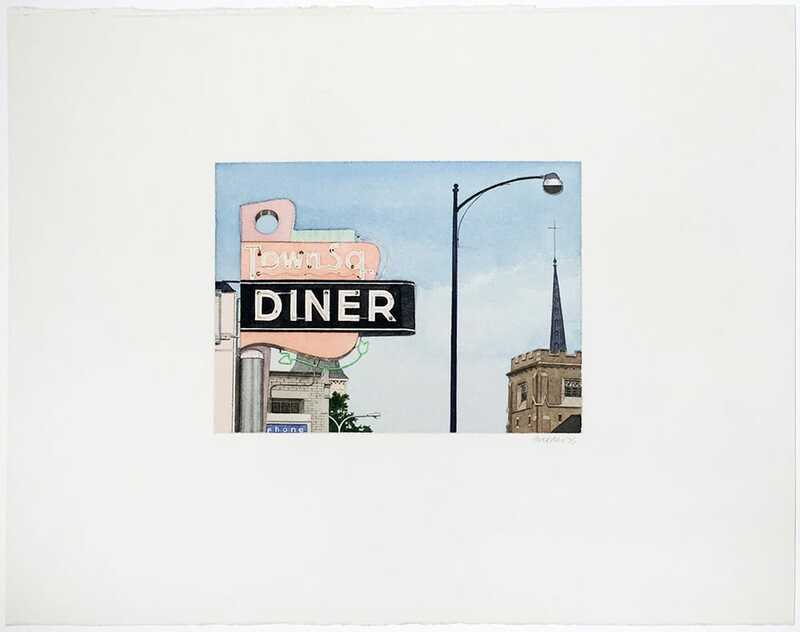 Baeder’s documentation of this microcosm captures an era and subculture of America that is quietly disappearing; a separate culture exists in these establishments and Baeder has been the most predominant figure in art history to capture its importance.